Through a commission from Dubbo City Council, Accuweigh has introduced the Mobile Weighbridge to help eliminate accidental overloading of trucks leaving the council’s quarry. Supplied by Accuweigh’s QWM branch, these Mobile Weighbridges feature a drop centre design to assist in minimising the height of the weighing decks. 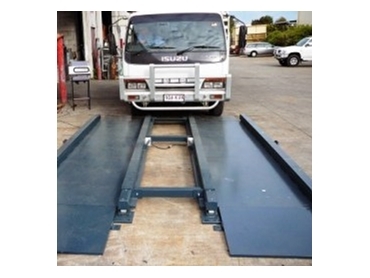 The drop centre Mobile Weighbridges use load cells mounted outside of the vehicle tracks to allow shallow angle ramps for easy truck access. Accuweigh’s Mobile Weighbridges does not require expensive foundations and can be positioned on any hard surface for non-trade weighing purposes. The Mobile Weighbridge is 4m x 2.5m with ramps 0.9 m wide and joined by removable struts to allow the Mobile Weighbridge to be relocated with minimal effort. The industrial load cells used in the Mobile Weighbridge are 15T each with a total of 4 load cells used on each track section. Accuweigh’s Mobile Weighbridges are also accompanides with a digital weight indicator to help capture and display each of the axle’s weight, as well as the total truck’s weight after the truck has exited the Mobile Weighbridge.